Peter Lascarides grew up in Queens, NY, and attended Binghamton University, where he graduated with a Bachelor’s degree in Biochemistry. He attended New York College of Osteopathic Medicine, and completed his PM&R residency at Stony Brook University Hospital. He now continues his training as a Pain Medicine Fellow at the Montefiore Multidisciplinary Pain Program. In his spare time he enjoys playing soccer, fishing, skiing, and watching the New York Rangers. 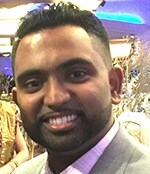 Sunil Thomas grew up in Queens and attended New Jersey Institute of Technology for the accelerated BS/MD program with St. George’s University. He graduated with a BS in Engineering Science with a focus in Biomedical Engineering. He then went on to St. George’s University School of Medicine. He went on to spend a year in Binghamton NY for internship year where he also served as a Clinical Instructor for SUNY Upstate Medical School. He completed PM&R residency at Montefiore and continues fellowship in Interventional Pain. He and his wife are expecting their first child in February and they could not be more excited. Cyrus Kao grew up in Los Angeles, CA, and attended UC Berkeley, where he received a BA in Public Health and a BS in Integrative Biology. He then went on to attend St. George University for medical school. After a preliminary Internal Medicine year at SUNY Downstate Medical Center, he completed his residency in Physical Medicine and Rehabilitation at Georgetown University. 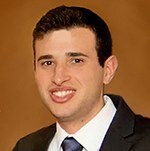 He is currently Pain Medicine Fellow at Montefiore Medical Center in the Bronx, and plans to stay in the Greater New York area post fellowship. Ravi Patel joins the Montefiore family the PMR residency at Kessler. He attended medical school at Drexel University in Philly. He is happy to have returned to the tri-state area and currently lives in New Jersey.